White larvae, producing attractive pure white cocoons. 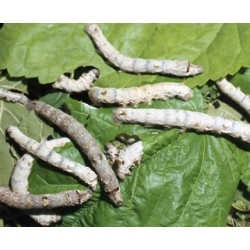 Silkworms require Mulberry leaf, or artificial diet. In winter orders will be booked for supply in the spring. The best rearing season is May to October. Eggs supplied from October onwards are for hatching in the following year. Although there are reports of using other foodplants, the only satisfactory food plant for silkworms is Mulberry. This is sometimes found in the gardens of large houses and old parsonages. Mulberry trees are available from larger nurseries. Any Morus species is suitable: White, Black or any other Mulberry. The larvae eat a lot, so make sure you have a good supply of leaves. NOW YOU CAN REAR SILKWORMS EVEN IF YOU HAVE NO MULBERRY! There are sachets of artificial diet that you make up in the kitchen. Each sachet is the amount needed to rear 20 silkworms throughout their life.